So, with business systems, the biggest challenge is making sure that users are saving files to the right place, so the backup routines can back up the file. If users are saving things to their “My Documents” folder, and you’re not redirecting “My Documents” to a network folder on a server, you’ve got a big potential problem brewing. Ditto if people are saving things to their Windows Desktop, which is possibly the worst place to save things that you care about keeping. But there’s an even more fundamental thing to remember, and to communicate to our users: The best, most comprehensive backup strategy in the world won’t save you if you forget to save your work in the first place! Even in a Hosted Private Cloud environment, where the cloud services provider goes to great lengths to back up your data and replicate it between geo-redundant data centers, there’s not much that can be done if you don’t save it. Just as many of us have learned a painful lesson about backing up our data by having lost it, many of us have also had that sinking feeling of accidentally closing a document without saving it, or having the PC shut down due to a power interruption, and realizing that we just lost hours of work. Notice the text that I’ve circled in red? It says “IMPORTANT The Save button is still your best friend. 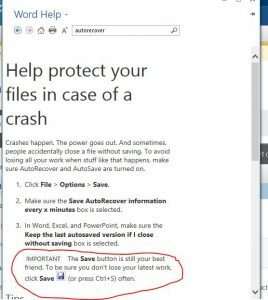 To be sure you don’t lose your latest work, click Save (or press Ctrl+S) often.” Bottom line: Autorecovery may save your backside at some point…or it may not. And corporate backup routines certainly won’t rescue you if you don’t save your work. So save early and often. And if you’re a mobile user who frequently works while disconnected from the corporate network, it’s a good idea to save your files in multiple locations. Both Microsoft (OneDrive) and Google (Google Drive) will give you 15 Gb of free on-line storage. 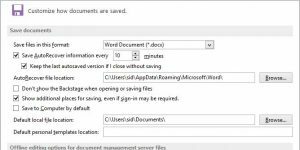 And if it’s too much trouble to remember to manually save (or copy) your files to more than one location, there are a variety of ways to set up a folder on your PC or laptop that automatically synchronizes with a folder in the cloud whenever you’re connected to the Internet (e.g., eFolder Anchor, Citrix ShareFile, etc.). You just have to remember to save things to that folder. You just have to remember to save things, period. Did we mention saving your work early and often? Yeah. Save early and often. It’s the best habit you can develop to protect yourself against data loss.